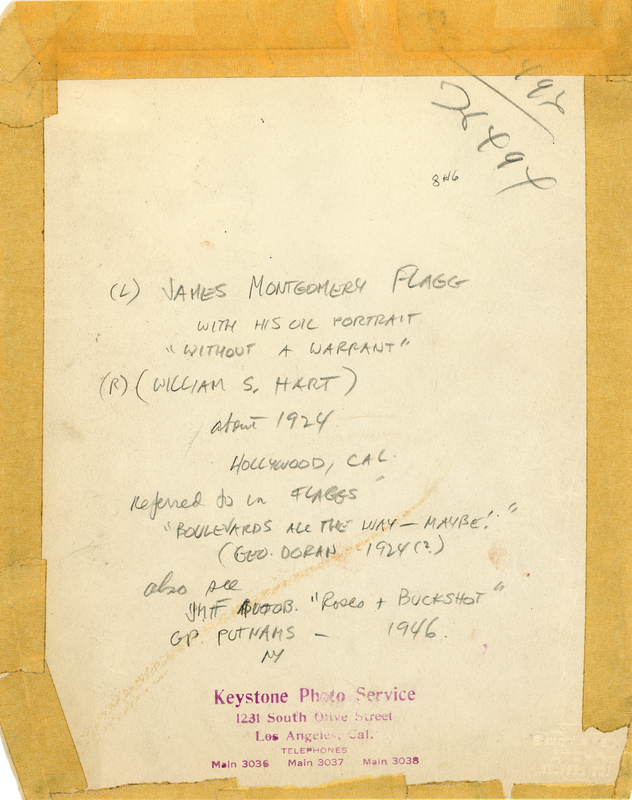 SCVHistory.com LW2321 | William S. Hart | James Montgomery Flagg Presents Portrait to Hart; Photo Autographed by Both, 1924. 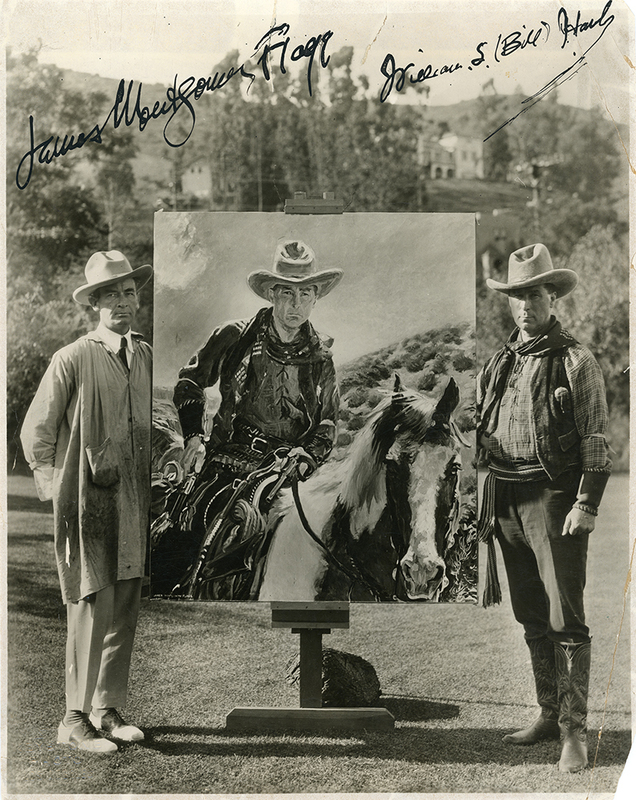 Artist James Montgomery Flagg (left) presents his oil painting of William S. Hart astride his horse, Fritz, to the actor at his Hollywood home (8341 De Longpre Avenue, now in the city of West Hollywood), in 1924. Photograph by Tilagg of Hollywood and distributed by Keystone Photo Service, 1231 South Olive Street, Los Angeles. 7.75x9.75 glossy print, autographed by Flagg and Hart. 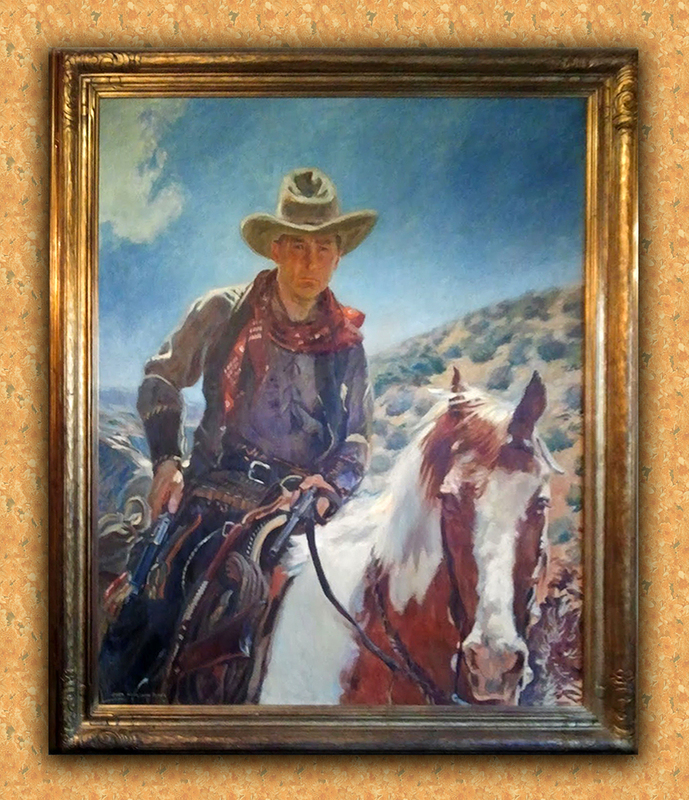 According to the Hart Museum in Newhall, where Flagg's oil panting hangs in the downstairs dining room, the title of the painting is "The Bounty Hunter." According to an early collector of this signed photographic print, the title of the painting is "Without a Warrant" (see collector's notes on back of photograph at bottom). It should be noted the photograph was made in 1924 and the (unknown) collector's notes were written no earlier than 1946. Flagg does not state the name of the painting in his 1925 discussion of his 1924 visit with Hart here or in his 1946 autobiography. Neither does Hart, in his own 1929 autobiography. Flagg spent several weeks with Hart as he painted the work (see Los Angeles Times below, July 27, 1924). Flagg painted studies of Hart's horse, Fritz, in Newhall; Hart posed for the painting at his Hollywood home by sitting on a whiskey barrel that supposedly predated Prohibition (which took effect in 1920). James Montgomery Flagg came a-honeymooning to my little Hollywood home. Jim had been wanting for years to do an oil painting of my pony and myself, so, planting himself at the wheel of his car and placing his bride beside him, he motored across America. I was sort of in the dumps, and the few weeks that Jim and Dorothy spent with us did me a lot of good. Jim started his painting up at the ranch; but he hadn't squared things with Fritz. A few days of standing still, with me on his back, and the rest of his family standing around making bright remarks, was too much for the little autocrat. He quit cold. Jim had to continue his work at Hollywood. Fortunately, he had put in all of his time working on Fritz and could finish him from memory. But my end of it was not so easy. Instead of a live horse, I got a saw-horse with a pre-Volstead whiskey barrel on top of it. Nothing in the humorous line, from A to Izzard, ever escaped Jim Flagg ... and the all too ludicrous sight of the "bad guy" perched on top of a whiskey barrel kept his keen wit bubbling so much that he was forced to spend his spare moments hiding in a vine-covered pergola where he worked off his mirth on paper; the result being, "Boulevards all the Way Maybe," a rich, whimsical description of his journey through Missouri mud and over Nevada deserts, to find for an inspiration, at the end of his rainbow, a bad man — guns an' all — riding a whiskey barrel on a Hollywood lawn. I can understand Jim's book being a laugh-provoker, but I can't understand why he never used the guns when they were always handy. Davis (2003) adds: "Hart complained that his face was weary from holding a ferocious grimace so long" (pg. 183). Cropped version shown in Flagg's 1946 autobiography. Click to enlarge. Looking at the two men flanking the portrait, which does the man sitting on the horse more closely resemble? Flagg reproduced a cropped version of this image in his autobiography, "Roses and Buckshot" (G.P. Putnam's Sons, New York, 1946, pg. 112 ff.). It is unknown if Flagg used this exact print, although it would explain the cropping. In the book, Flagg refers to the horse as "Paint." Hart often referred to Fritz as "Paint." Fritz was both a paint (breeding) and a pinto (coloring). 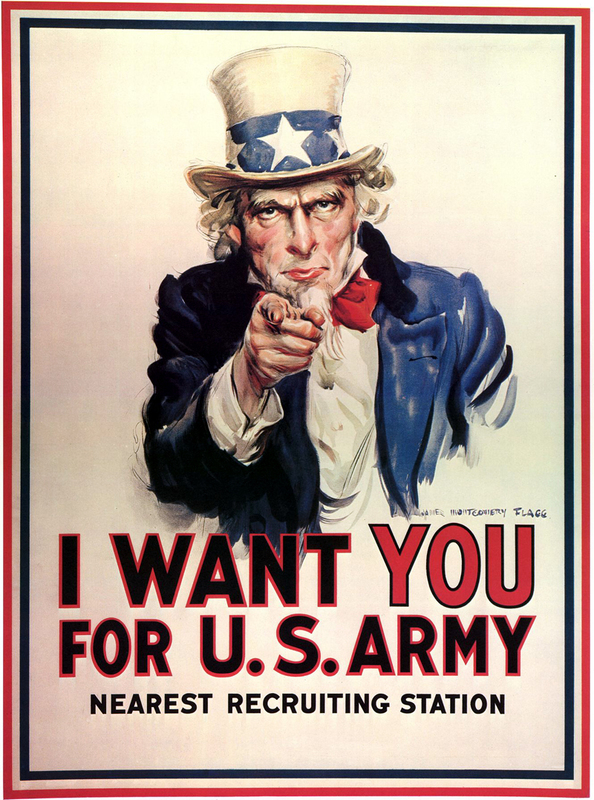 Flagg (1877-1960) was most famous for his Uncle Sam / I Want You For U.S. Army recruiting poster, which he first created in 1916 for Leslie magazine, aka Leslie's Weekly (formerly Frank Leslie's Illustrated Newspaper), and then recreated while working as a military propaganda poster artist during World War I.
Flagg had previously created a series of illustrations for "Fritz's book," "Told Under a White Oak Tree" (1922). Years later, Flagg would paint a portrait of Hart's sister, Mary Ellen, which hangs in the upstairs living room of the Newhall mansion. 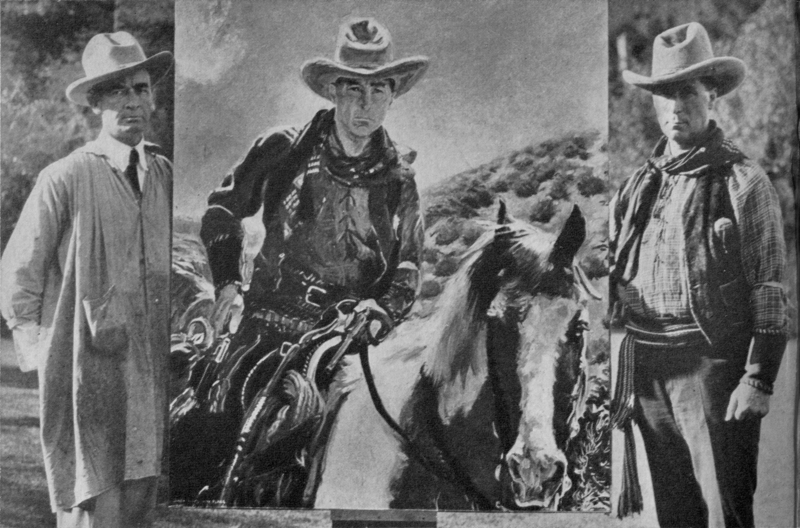 In 1951, five years after Hart's death, Flagg drew a sketch of his "pardner" (shown below right). 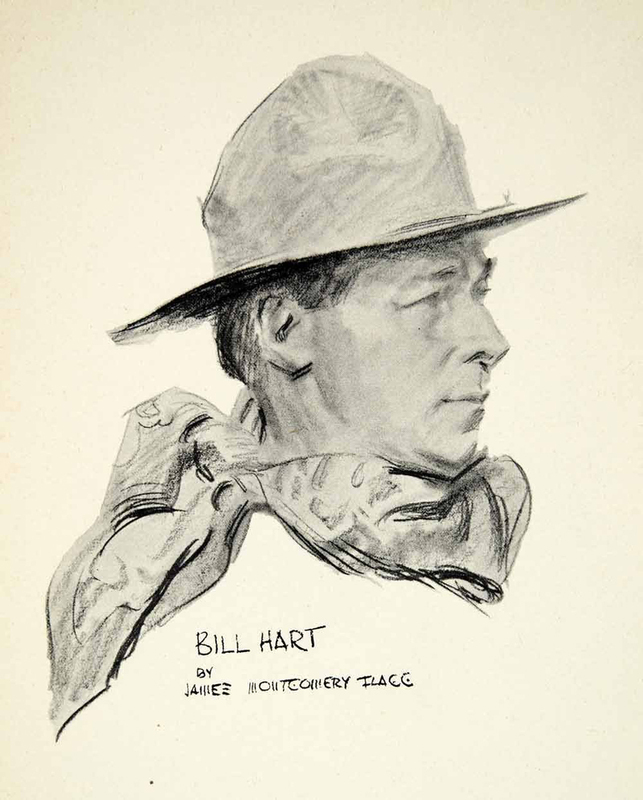 Artist James Montgomery Flagg writes about William S. Hart, 1925. Letter: Hart Sends Flagg $500 for Portrait of Sister, March 3, 1945. Flagg Painting of Hart's Horse Comes Home After 90-Plus Years, June 29, 2018. LW2321c: 9600 dpi jpeg from original photograph purchased 2018 by Leon Worden. Documentation on file.